For decorating with royal icing and gel. Decoratively apply royal icing and gel to cakes, candies, cookies and cupcakes. For bbq sauces, condiments, dressings, oils and other sauces in cooking and food preparation. Also used for white and yellow glues used for crafting and woodworking. Select the size bottle you want. Each size is in a pack of six. If using water or liquid you may need to retightening the cap with extra effort. Plastic wrap may be added to threads before attaching cap for an extra tight fit. Each size is sold separately. Quantity of 6 bottles are sold in each package. 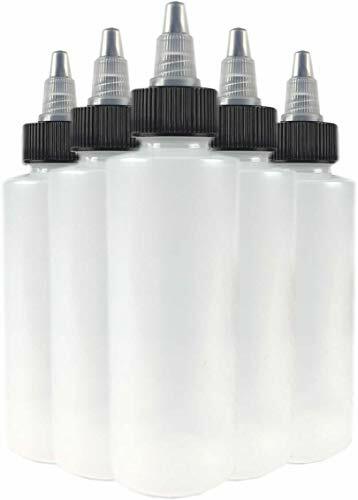 Tighten caps on bottles: If using water or liquid you may need to retightening the cap with extra effort. Plastic wrap may be added to threads before attaching cap for an extra tight fit. Russian Piping Tips 15 PCS, For the Creative Mom. Icing Nozzles Decorating Tools for Family Occasion. 1 Tricolor Coupler + A Single-Color Coupler & 20 Disposable Bags.